Expertly planned bespoke itineraries to the South Pacific. Follow us on our own personal journeys as well! 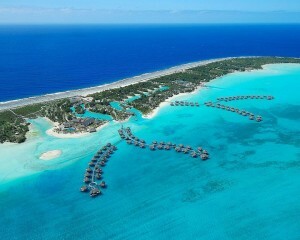 We mentioned last week that Bora Bora is our top destination request. 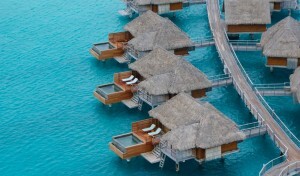 However, within Bora Bora, our top resort request is for the Four Seasons Resort Bora Bora. It’s not only the most sought after resort on Bora Bora, but it’s become one of the most sought after resorts in the entire South Pacific region, perhaps even the world. It’s popular with celebrities and is considered to be the ultimate honeymoon and romance destination. It also ticks the box as a top bucket list experience. The Four Seasons is a large property, yet it’s configured in a way that allows for seclusion and privacy. As you wind your way around the resort, past the various lagoon inlets surrounded by coconut palms, you’ll make your way to the beach, where you’ll find some of the most luxurious accommodations in the South Pacific. 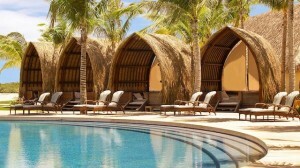 The Four Seasons offers 121 villas in total, with the beach villas being the largest villas on the property. The beach villas start at 1905 square feet and, at minimum, provide 2 bedrooms and are well suited for families or couples traveling together. For larger groups/families, the 3 bedroom Otemanu Villa is over 5,300 square feet and has four bathrooms and a private pool. For couples, the overwater bungalows are the highlight of the resort. The overwater bungalows are categorized by view- beach, lagoon, and mountain. All feature the same layout and amenities. However, 4 bungalows have an extra special amenity- a plunge pool! These pool bungalows have the same layout as the other overwater bungalow categories, have mountain views, and access to the plunge pool from the bedroom. While the Four Seasons offers fantastic programs for kids and teens, those who are traveling for a romantic experience are in for a treat. The Four Seasons offers many romantic touches that can be added to any stay, from something as simple to a floral scented bath, to a sunset dinner on the beach, a floating “love seat”, or a vow renewal on a private motu. The Four Seasons has many choices to make your stay extra special and the resort will bend over backwards to accommodate any special requests that you have. As we mentioned, the Four Seasons in a large property, so there are many activities and restaurants to choose from. The Four Seasons features some of Bora Bora’s finest restaurants, including Arii Moana, which offers French and seafood specialties. The resort also has an onsite dive shop, tennis courts, a 24 hour fitness center, and even a private helipad! Even though you get to play in the world’s most gorgeous lagoon, the Four Seasons pool cabanas can also be a luxurious and relaxing hideaway. For those who want extra pampering, the Four Seasons also boasts a world class spa, where you can enjoy a variety of treatments. Of particular note is the special suite set aside for couples treatments. If all of this isn’t enough for you, you can also consider purchasing your very own slice of paradise! The Four Seasons Bora Bora offers 15 residences for those who want, and can afford, permanent paradise. Just imagine waking up to the view of Mt. Otemanu for a few weeks every year for the rest of your life!!! Bora Bora is reached via interisland flight on Air Tahiti followed by a 15 minute ride on the resort’s private boat shuttle. We highly recommend a stay at the Four Seasons Resort Bora Bora if you are looking for the ultimate in luxury. The Four Seasons also offers commanding views of the main island, exquisite sunset views, an exceptional spa, and a well thought out kid’s program. A stay at the Four Seasons pairs well with a stay on any island, but is an excellent choice when combining your stay at other luxury properties, such as Le Taha’a or The Brando. We recommend at least 3 nights on any one island, but Bora Bora has a lot to offer and can easily be enjoyed for stays up to a week! To secure your spot in paradise, be prepared to book early and have a healthy budget. Please connect with me for additional information and pricing. My name is Janelle and I'm a luxury travel consultant with Luxe Island Escapes by Easy Escapes Travel and an avid traveler! I specialize in customized luxury travel to the South Pacific, whether it be a quick get-a-way, honeymoon, or a bucket list adventure. In addition to being a Certified Tahiti Specialist®, I am also a certified specialist for Fiji, The Cook Islands, New Zealand and Australia. To learn more about me, my services, and my certifications, please visit the About page. Check out the latest South Pacific Travel Promotions!